This tool adds the missing UUIDs into the installed Xcode plugins so that they can be loaded by newer versions of Xcode. You can choose to run it once or install a launch agent that will trigger the tool every time any of your installed plugins are modified or Xcode/Xcode-beta gets updated. This tool also allows you to unsign Xcode in order to run plugins on Xcode 8 and later. For more information on why this is needed, see alcatraz/Alcatraz#475. When unsigning Xcode, you will also be prompted to unsign xcodebuild; Doing so will allow xcodebuild to load plugins and silence the library validation warnings. More info at #8. If you are having any issues, please check common issues before creating an issue. 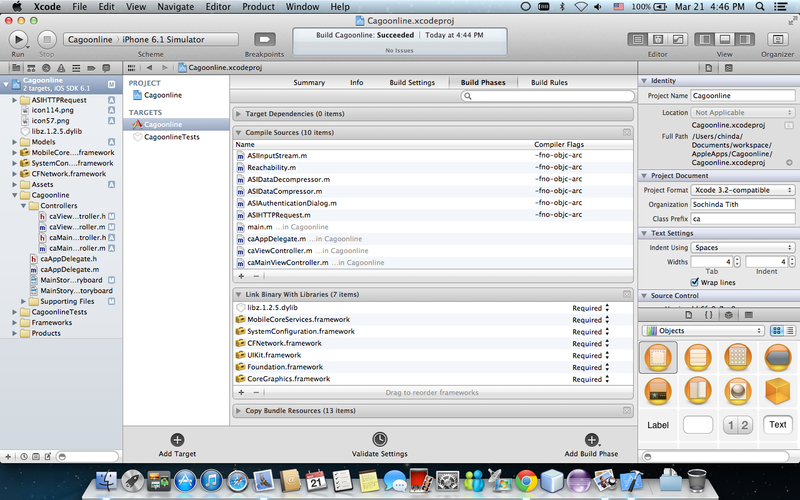 One or more of the plugins you are using are incompatible with your version of Xcode and are causing it to crash. The crash report will generally include the name of the responsible plugin. If unsure, start removing your plugins one by one until you find the culprit. In the last tutorial of our iOS Programming 101 series, we showed you how to customize the navigation bar and buttons with your own background image. 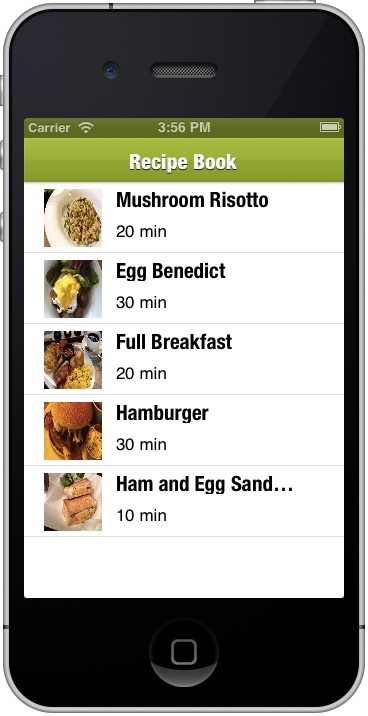 This time, we’ll look into the customization and styling of UITableView and UITableViewCell. 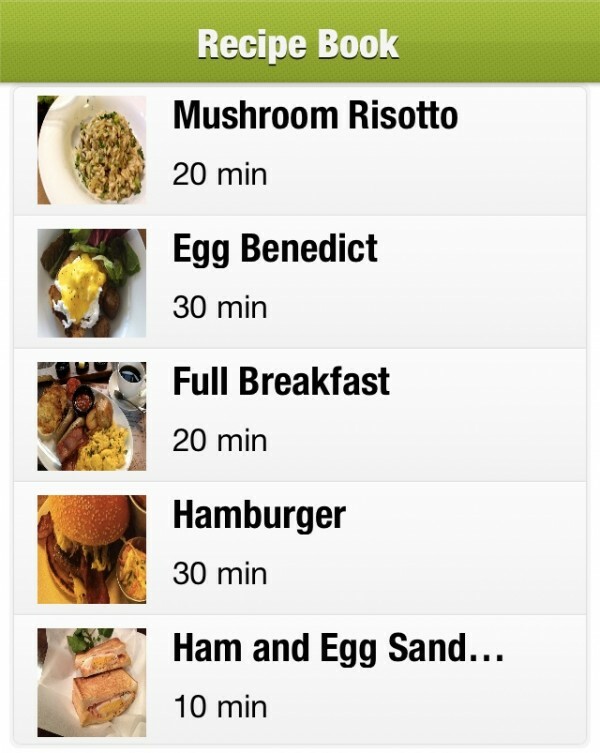 To illustrate the customization, we’ll tweak a simple table view, style it and make it more attractive. To help you focus on learning the customization, we’ve prepared the Xcode project for you to start with. Before proceeding, first download the Xcode project here (note: the project is created using Xcode 4.5). Since the release of iOS 5, Apple introduced Storyboarding that simplifies the way to design user interfaces for your app. To customize a table cell, you no longer need to create a separate cell in Interface Builder. You can design the cell right inside the Storyboard editor. 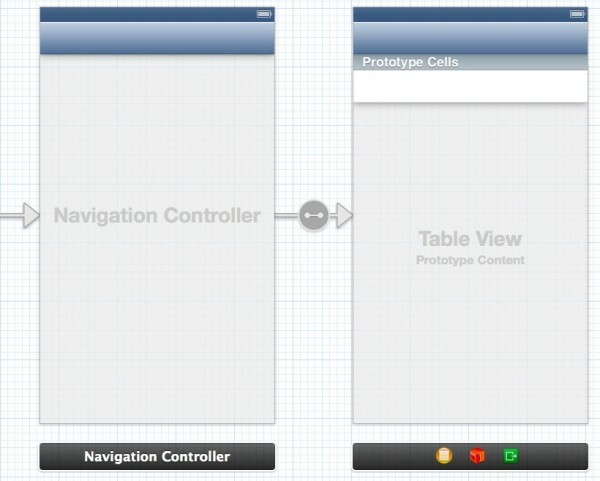 When you add a UITableViewController in the Story, by default, you should see an empty prototype cell. You can now add other UI control elements (e.g. UILabel, UIImageView) right into the prototype cell. Let’s first change the height of the cell. Select the Prototype Cells, click the “Size” inspector and change the row height from 44 to 71. Switch to the “Attributes” inspector, set the “Tag” to 100. You can think of a tag as an unique identifier of the UI control. Later in our code, we’ll use this tag to identify the image view. Then drag a label to the cell and name it as “RecipeName”. This label is used to display the name of recipe. In the “Size” inspector, set “X” as 92, “Y” as 7, “Width” as 186 and “Height” as 21. In the “Attributes” inspector, change the font type to “Helvetica Neue Condensed Bold” and set the font size to 21 points. Finally, set the “Tag” value to 101. Add another label to the cell and name it as “Details”. In the “Size” inspector, set “X” as 92, “Y” as 32, “Width” as 186 and “Height” as 33. Switch to the “Attributes” inspector, set the “Tag” value as 102. We’ve added the code (from line 12 to 20) for displaying the cell labels and image view. As you can see from the code, we invoke the “viewWithTag:” method with the tag value to identify the UI component. Now you’ve learnt how to create custom table cell using Storyboard, but the table view cell is just in plain style. We want to change the look & feel of the table cells and make them prettier. In the Xcode project, you should find three background images for table cell. The images are specially designed for different types of cells. For the first row of the cell (i.e. rowIndex == 0), the method returns the top cell image. If it’s the last table cell (i.e. rowIndex == rowCount – 1), the method returns the bottom cell image. For the rest of table cell, it simply returns the middle cell image. Lastly, add the following line of code in the “viewDidLoad” method of RecipeViewController.m. This tells the table cell not to show the separator as our own cell images already come with the separator. 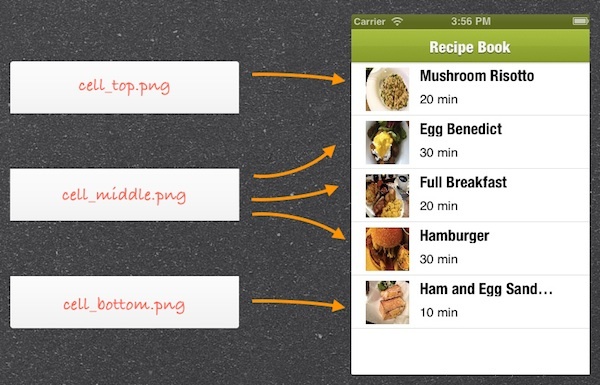 As the RecipeViewController is a subclass of UITableViewController, we use “self.parentViewController” to access its parent view, followed by assigning the background. By default, the table view is displayed in white. We set its color to transparent so as not to block out the background of the parent view. Again, I hope you enjoy the tutorial and find it useful. For your complete reference, you can download the final Xcode project here. Earlier, we already showed you how to customize the tab bar and navigation bar. 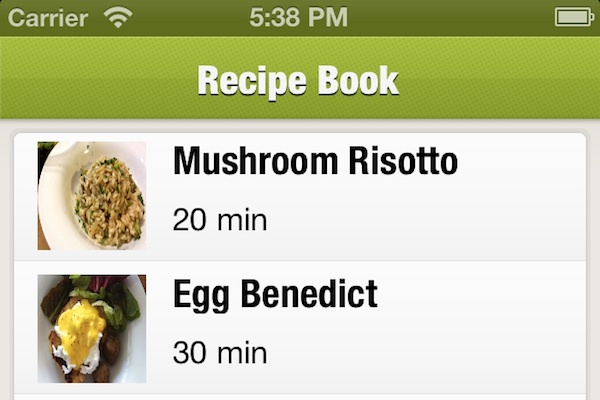 Combining with this tutorial, you should be able to make your table-based app more attractive. Later, we’ll see how to style other UI elements. Stay tuned. Undefined symbols for architecture i386: “_OBJC_CLASS_$_ASIHTTPRequest”, referenced from:…. Right click on XCode and select ‘Show Package Contents’. Open it and under DefaultProperties set CODE_SIGNING_REQUIRED to NO. Copy it back and replace the original file. Under Code Signing find Code Signing Identity and for both Debug and Release modes setAny iOS SKD to Don't Code Sign. Now you should be able to build your project without any errors. Right click on [NameOfYourProject].app and select ‘Show in Finder’. You should be able to get an IPA by clicking ‘Distribute…’ in Organizer->Archives, and choosing to ‘Save for Enterprise or Ad-Hoc Deployment’. In this application we will se how to display SplashScreen. When user run the application, it will show the splashScreen after some time it will automatically remove from the Screen. Basically this is the very simple application. So just have a look, how it will be worked. Step 1: Create a View base application using template. Give the application name “DisplaySplashScreen”. Step 3: Expand classes and notice Interface Builder created the DisplaySplashScreenViewController class for you. Expand Resources and notice the template generated a separate nib, DisplaySplashScreenViewController.xib, for the “DisplaySplashScreen”. Step 4: We need to add the resource file called as “themes.png” into the resource folder. Select resources and add files existing sources and select the themes.png. Step 6: Double click your DisplaySplashScreen.xib file open it to the Interface Builder. Drag the view from the library and place it to the Main Window(See the figure1 below). Open the second view icon from the MainWindow,drag the image view from the library and place it to the view window,select the view and bring up Attribute Inspector select the image “themes.png”. Select the File’s Owner icon from the MainWindow and bring up Connection Inspector, drag from the displayScreen to the last view icon (See the figure2 below) and connect File’s Owner icon to the view (See the figure3 below). Now save it , close it and go back to the Xcode. Figure 2: Connection Between displayScreen and View icon. Figure 3: Connection Between File’s Owner icon to the View icon. Step 8: In the DisplaySplashScreenAppDelegate.m file make the following changes in the file. Step 9: Now compile and run the application in the Simulator.